Articles describing the various ways members of the 0.1% think they can ride out the coming economic and political upheaval in close to their current level of comfort simply confirm how utterly out of touch they are with real world realities. I’ve reproduced a post from Capital & Main that gives a recent sighting. The reason this is all laughable is that none of these super glam well-stocked bunkers are good for anything beyond roughly five years of hiding out. And this isn’t just my line of thinking. A friend who knows more super-rich people than he should for his own good says based on his discussions with people who have built compounds like this, or know about ones that have been set up, they all think they just need to camp out for a few years and they can then come back and restore a version of their former overlordship. Good luck with that. And that’s if they are lucky. For starters, they’ve become used to first world medications. Do you think they will stock the equivalent of a local drug store pharmacy? And even if they do, most drugs have a three to four year shelf life. You can use them for maybe a year beyond that, but their potency goes kaput at a certain point. How are these folks going to get on in a world without antibiotics? And that’s before you get to other not-trivial medical risks. What happens if someone cracks the root of a tooth and needs it extracted? Since they’ve eschewed vaccines, what happens if someone gets tetanus? How about being bitten by a rabid critter or a poisonous snake? Where do they get Lyme disease treated? What do they do in the event of appendicitis, diverticulitis, cancer, or just a bad bone break? The super rich also appear to think they can continue to use advanced technology. What happens when hard disks, solid state storage, and chips fail? Even if they allow for a certain amount of redundancy and backups, at a certain point they will run out of items they can cannibalize. Backups die. Connector ports fail. Keyboards fail. All of this stuff was designed with planned obsolescence in mind. They will be hoist on the tech industry’s short product lifespan petard. Another point of failure is getting to the compound. Most of these high end preppers have figured out that the private jet pilot is a weak link, and thus the general line of thinking is that they need to allow them to bring their immediate family to the compound. But the pilot is useless once he has ferried his bosses. Even though the rich screen their captains for their supposed loyalty, won’t some wonder if they are at risk of being shot on arrival as costly and unnecessary mouths to feed? Why won’t they simply take off to the compound with their own families and operate it with the security crew for their own benefit, and leave the rich dudes behind? And they finally don’t seem to have considered that the great unwashed 99% includes people who are members of the military. These compounds appear to be set up to withstand assault by armed militias and maybe a car bomb or two. How about ariel assault with Napalm or whatever new nasty that is on offer? What about a electromagnetic bomb? The ones that appear more resistant to attack, like former bomb shelters, are vulnerable to having their air supply cut off or toxic gasses pumped in. The tacit assumption that these shelters will be difficult targets, and desperate people will go after easier prey, meaning each other. But in the early stages of an unraveling, someone with a grudge and access to the right weaponry should not be underestimated. Maybe they’ve been watching too many dystopian movies about the end of civilization as we know it. Or perhaps they feel the anxiety other people feel about social instability in the country. They may think nuclear war a high probability or that climate change disasters are inevitable. But while you and I fret over these apocalyptic scenarios, the super-rich are planning their survival. Even as the nation suffers a coast-to-coast housing crisis, they are investing in “safe” places to live. The federal government began doomsday preparations as far back as the 1940s, when they started construction on an underground military command center in the mountains of Pennsylvania. Nuclear bunkers in Virginia and Colorado were also constructed. So even if the country did not physically survive, as Garrett Graff wrote in a book on this subject, at least the “idea” of America would – or some such strange notion. Civilians explored their own options, beginning with the 1950s fad of backyard bomb shelters. But now the really rich – from New York to Silicon Valley to Florida – are spending millions of dollars preparing for the worst. 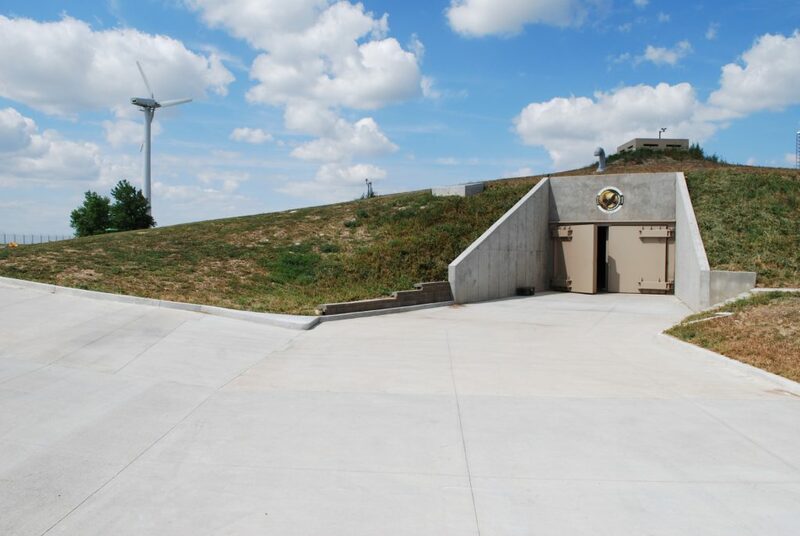 One developer offers $3 million condos in Kansas built inside a decommissioned missile silo. The units come equipped with “state-of-the-art technologies,” walls covered with the outdoor scenes of your choice, a five-year perpetual food system and a self-contained source of electricity and water. The whole thing is guarded by a 24-hour crew of guys with automatic weapons. The concept works like this: Whatever disaster you imagine still provides enough time to get from wherever you happen to be at the moment – whether vacationing on a yacht in the Caribbean or making investments from your home office in the hills above Palo Alto – to your protected, underground refuge where you and your family will be safe. A former Atlas missile silo in Kansas has been transformed into an underground shelter with luxury condos. Photo via SurvivalCondo.com. The developer who picked a silo to refurbish decided it should be no more than 30 minutes from the nearest airport. So the rich can fly there in their private planes and easily motor to the site. Imagine that a mogul gathers his family and gets through the chaos of local traffic, boards his plane and his private pilot – who either brings or sacrifices his own family – flies them from, say, Santa Monica airport to Salinas, Kansas. Despite the crisis, there’s enough fuel for the plane, air traffic controllers operate as usual, and the airports still function. Local gas station owners still sell enough gas – at whatever the price – for your SUV to reach the shelter. Some super-rich have seen the problems with this scenario and learned to ride motorcycles to circumvent the problems of traffic, fuel and general chaos. The shelter itself comes equipped with all the things people need to survive: entertainment, the illusion of the outdoors, a workout room, a “dog park,” water and electricity. According to the advertising, it’s self-contained. No dependence on outside services. These systems have been designed to not break down or need repair for the duration. Safe, secure, insular. Outside the guards faithfully show up every day and keep the armed vigilantes and refugees from raiding the site. They willingly surrender their own families and endure the hardships of whatever chaos to protect the rich in their perfect silo. Of course these special super-rich families will need to give up some conveniences. Deliveries, even by drone, will likely not arrive. Undocumented immigrants will not be available to clean, cook, or provide child care. News and crisis updates may be hard to get. Haircuts and manicures will likely be impossible. Clean, pressed clothes – the list of services these people will lose goes on. Oh, and unless there’s a doctor or a dentist who have also bought into your silo, medical care could be a problem. People who have managed to achieve such a level of wealth – however lucky to be in the right place at the right time – are not naïve. They must know that however comfortable and secure their escape, nothing has prepared them to survive catastrophic disaster any more than the rest of us. Only an arrogance that diminishes and disparages working people could so obscure the reality of existence under such circumstances. Otherwise, how could they ignore other human beings just to save themselves? There have been other times in this country’s history that challenged our sense of survival. But a different ethic prevailed: We’re all in this together, people said to one another. They thought we should face the crisis as a community, as a people, because they knew that at every step our lives intersect with others, depend upon others – especially people we cannot see and likely do not know. Maybe the difference now is that too many of the super-rich – maybe too many of all of us – believe a myth of the movies: that one guy with a gun and enough money can survive anything. This entry was posted in Banana republic, Doomsday scenarios, Income disparity on August 22, 2017 by Yves Smith.